Member News, Whirlowbrook Hall Event, West Haigh Event, Shirebrook Event, SYO hoodies, Club Night, Coaching, Club officials, JK report, T'shirt participation Update, Scottish relays, Yvette Baker Trophy Heat, Canklow Event report, Parkwood Springs Event Report. A very warm welcome to new members Ingun Borg, Alice & Sofia Stephenson, Jason Koccis, Lily Koccis and Isabella Hitchcock. Good luck to all members competing in the Northern Champs this Sunday. Our first daylight evening event will be held on Wed 18th April at Whirlowbrook Hall and Limb Valley. There will be 3 courses on offer - a short easy course for younger juniors, a medium 1 hour score event and a long technical (comprising of a 2.5km course followed by score to be completed in 1 hour). Starts are 6-7pm. Please pre-order your maps by emailing Pauline by midnight on Tuesday 17th April. More details here. Our next large regional event is on Sunday 29th April at West Haigh near Grimethorpe. The woodland has been remapped and the New Park Springs nature reserved added to the map. Experienced orienteers will enjoyable the runnable terrain and interesting contour detail while newcomers and juniors are well catered for with the extensive path network. There are a range of courses to suit everyone from the easy white to the long technical brown. There is also a 8km course of medium difficulty designed for runners. More details here. Courses can be pre-entered on fabian4 to guarantee the map of your choice. Helpers are still required so if you are intending to come and can spare an hour or so to help, please email Paul and Judy Johnson. Volunteers receive a 50% discount on the cost of their entry - use code cx57a if pre-entering. This event will be the 7th event in the 2017 / 18 schools' and newcomers' series. Please note the change of venue - it is Shirebrook not Parkwood Springs. The map has been significantly extended for this event to incorporate the whole nature reserve. Alongside the normal white to long orange courses, there will also be a longer technical course for experienced orienteers. Full details here. Registration and starts are open 12:30 to 3:00 with courses closing 3:30pm. There will also be a refreshment stall run by the SYO juniors. Any cake donations will be gratefully received. 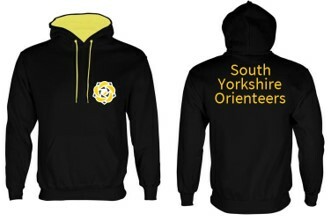 Last chance to order the new SYO hoody. The kids' tops are £17 and adults' £20. Click here for kids sizes and here for adults' sizes. Orders will be placed on Friday 20th April so please email Euan by Thursday 19th April if you would like one. Our weekly club night now moves outside for the summer and will take place on Wednesdays from 6.45-8.15pm at various locations. Once per month it incorporates the SYO evening event. The session is split roughly into 45 minutes of technical training and 45 minutes of physical training. The next coaching session is 1-2.30pm on Saturday 21st April at Canklow. This is a great area suitable for all abilities.The forecast for Saturday is 19 degrees and sunny - a dramatic change from the snow at the Tankersley session! Click here for more information. Please email Pauline by Friday 20th May if you would like to attend. These sessions are free to members. There is another Saturday coaching session scheduled for the 9th June at Hesley Scout Camp. Many thanks to all the people who have agreed to fulfil the major official roles. There are a couple of large events that still need volunteers and the normal array of Saturday and weekday evening events up for grabs! The Saturday or evening events are ideal for first timers. Please email Pauline if you can help. The Yvette Baker Trophy is an inter-club competition especially for juniors. Juniors run a course suitable for their age and experience. The younger less experienced juniors can run yellow in pairs so it really is suitable for everyone. SYO won the competition last year so we need a good turn out to ensure we qualify for the final on 1st July. SYO will be attending the heat hosted by EPOC at Oakwell Country Park on Sunday 13th May. More details here. Proceeds from our cake sales will be used to pay for junior entries. Look out for the email from Jacky, which will arrive in the next day or so, inviting you to take part. The Scottish Relays are being held at Rose Isle on Sunday 27th May, the day after the Scottish Individual Championships. If you intending to go and would like a relay run please email Tim by the 1st May. Information on the Scottish Championships can be found here. Sunday 11th March was Compass Sport Cup competition time with qualifying heats held up and down the country. This year it was SYO's turn to host the heat for this part of the country at Canklow. Surprisngly only 2 other clubs, in the cup competition for large clubs, chose to attend our heat but there were 6 clubs competing in the trophy competition for smaller clubs. Organiser Paul Bradbury found a fabulous new hardstanding car park and assembly area close to the start and finish. He also managed to organise the first warm and sunny day in months which encouraged people to hang around and sample the delights of the SYO Junior refreshment stand. Canklow is a small but interesting area comprising of a sloped deciduous woodland and a narrow strip of complex quarry workings. Colin Lynch planned interesting courses that criss crossed the area resulting in some fast and furious racing. SYO fielded a large team with 87 competing in the competition courses. It was fabulous to see so many club members doing their bit including lots of newer members taking part in their first CSC competition. SYO won by 20 points over DVO sealing a place in the final on Cannock Chase on 21st October - put the date in your diaries! DVO also qualify as we finished in the top 3 at the final last year so a good result for both clubs! Congratulations to the 5 course winners - Jenny P, Al B, Freya T, Dom D and Kim B who scored 100 points each - and the other scorers - Charlie A, Laura G, Andy P, Mark C, Aislinn P, Janet A, Seb M, Jamie L, Imogen P, Judy J, Paul B, Jenny J, Paul J, Jenny L, Matthew M, Paul T, Bill H, Pauline T, Henry M, James B, Naomi T, William G, Alex E and Nick L. Well done even if you didn't score as your contribution pushes down the scores of our competitors. In the Trophy competition EPOC were the victors in a tight competition between the smaller clubs, also securing a place in the final. Thank you to everyone who helped particularly Paul, Colin, Pete and Brian for fulfilling the major official roles. Thank you also to Jacky & Dom for co-ordinating the cake stall and raising £270 for the SYO juniors. More than 90 members travelled to the West Midlands over Easter weekend to compete in this year's JK competition. Despite the severe weather conditions, SYO members performed out of their skins to produce 22 individual medallists and 6 team relay podium positions - a truely fabulous club achievement! The weekend began on Good Friday with the Sprint event at the Stafford MoD. Whilst the navigation was technically easy, the racing was fast and furious and those that topped the results list proved they could perform under pressure. Well done to Robbie (1st M10), Anna (1st W10), Ella (2nd W10), Conrad (3rd M12), Freya (2nd W12), Imogen (1st W14), Pippa (3rd W20), Judy (2nd W65) and Peter G (3rd M70). Saturday saw the start of the JK overall individual competition with the middle race at Brereton Spurs. Despite overcast skies and freezing temperatures, the day stayed dry. The orienteering was physically and technically demanding and there were many top performances by SYO members. Robbie, Oscar, Conrad, Euan, Andy P, Charlie A, Brian, Anna, Charlotte, Freya, Imogen, Pippa, Amanda & Jenny P all held top 3 positions overnight. On Sunday the JK moved to Beaudesert for the classic distance and the 2nd day of the overall individual competition. Although the orienteering was not too technically demanding, the courses provided a significant physical challenge and keeping concentration to the very end was key to a good race. Well done to JK Champions Robbie Lightfoot (M10) and Freya Tryner (W12) who triumphed after 2 tough days in the forest. Congratulations also to silver medallists Charlotte Chapman (W10), Conrad Reuber (M12), Euan Tryner (M14), Jenny Peel (W50), Charlie Adams (M50) and Peter Gorvett (M70) and bronze medallists Anna Todd (W10), Oscar Peel (M10), Pippa Dakin (W20), Andy Preston (M40) and Amanda Crawshaw (W45). There were also good runs on the short classes for Mark C (1st M50S), Louise P (2nd W40S) and Wendy (1st W55S). In the Mini Relay Robbie, James and Freya won by a very impressive 6 minutes, whilst Ella, Oscar and Charlotte grabbed 3rd spot just 2 seconds ahead of 4th despite Charlotte falling in the mud on the run in but a quick return to 2 feet kept her in front. In the Junior Relay Sam C, Conrad and Euan had an equally impressive win by over 6 minutes. It was also really great to see our M18s finish 2nd in Men's Short relay - Ryan, Seb and Dom ran incredibly well against experienced adults. It was close in the Senior Women's relay with Amanda, Jenny J and Jenny P holding off SN by 30 seconds. In the Senior Men's relay Nick B, Andy P and Oli ran impressively to win over long term rivals FVO. A special mention must go to our members competing at their first JK. There were some very impressive performances in tough conditions. Let's hope the weather gods smile kindly on us at the remainder of this year's major competitions. The 6th event in the schools' league and newcomer series was held in glorious sunshine - a sharp contrast to the deep snow of the previous weekend. There was wonderful attendance again and it was also great to see experienced club members enjoying the technical courses alongside our normal schools event participants. Many thanks to everyone who helped, particularly the Tryners for organising, Mark Dakin for the advance planning and Aislinn for being the 'on-the-day' planner. The refreshment stall was very successful again raising £171 for the juniors - this will be used to pay for the entries at the Yvette Baker Heat on 13th May. Thank you to Susan Guy for co-ordinating and to everyone who contributed delicious homebaking. Well done to those SYO members topping the individual leagues - Ella (Y4G), Oscar (Y4B), Anna (Y5G), Robbie (Y5B), Ciara (Y6G), Millie (2nd Y7G), Conrad (Y7B), Carys (Y8G), Matthew (Y8B), Naomi (Y9G), William (Y9B), Alex E (Y10G), Jack (Y10B), Isabelle H (Y11G), Dom (Y11B) and Ryan (Y12B). In the schools competitions, Hunters Bar lead the primary competition with Nethergreen in 2nd and Dobcroft in 3rd; whilst in the secondary competition High Storrs lead with Notre Dame 2nd and Tapton 3rd. Full league results can be seen here. Whilst most of the club were competing at the Compass Sport Cup heat at Canklow, 8 members of SYO were doing their bit for England competing in the Interland competition in the Netherlands.The whole SYO contingent aquitted themselves brilliantly. Well done to course winners Nick B (M40) and Euan T (M14). There were also great results for Sam C (4th M14), Max M (5th M14), Ryan E (11th M20), Amanda (5th W40), Lucy W (7th W40), Martin (6th M50) and Sam F (ShUOC 8th M20).